Sir Jackie Stewart says it is a "big ask" for Max Verstappen to make his grand prix weekend debut in Japan aged 17, but if he delivers, he has the potential to be a "superstar". The Dutchman will drive for Toro Rosso, for whom he will race in 2015, in first practice at Suzuka on Friday. "The world is looking at him - and that's not a small piece of pressure," Stewart, 75, told BBC Sport. "He has been sensational early in his career, but F1 is another story." 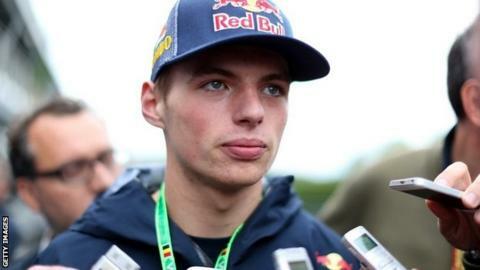 Max Verstappen is the son of ex-F1 driver Jos, who scored two podiums in 106 starts. The 17-year-old was a successful kart racer before driving for Van Amersfoort Racing in this year's Formula Three Championship. He made an impressive transition to F3, winning six consecutive races at one stage, and has eight victories in 27 races so far this season, leaving him second to Frenchman Esteban Ocon in the overall standings. The three-time world champion added: "He will face more pressure than a young driver would have been exposed to years ago. "I've seen some great young drivers come along and the pressure has been too much for them. It can go either way. "It'll be interesting to see how he adapts to that. There has been so much talk about him and his age. It's a big ask." Suzuka is considered to be one of the toughest circuits in the world and regarded as an extreme test for even the most experienced drivers. But while Stewart acknowledges the challenge, he points out the huge benefits a strong performance could bring. "There is no doubt that he has been given one of the most difficult tracks on the calendar to make his debut," he said . "But he will have spent some time in the simulator practising the track - and that's a big advantage. "He's an experienced racing driver and has won everything that can be won in karting and then formative classes. "Toro Rosso believe they have to give him a shot. If he does that well, he is going to become a young superstar." Verstappen, who is currently racing Formula Three, is the son of former F1 driver Jos, 42, who contested 106 grands prix between 1994 and 2003. The Dutchman will become the youngest driver ever to take part in a grand prix weekend when he gets behind the wheel on Friday at 01:00 BST, three days after his 17th birthday. Sebastian Vettel was 19 years and 53 days when he took part in free practice for BMW Sauber in Turkey in 2006. By joining Red Bull's junior team, Verstappen is following the same career path as four-time world champion Vettel and his Red Bull team-mate, Australian Daniel Ricciardo.